Just wondering out loud why I have never seen quad plates with the kingpins on the opposite side of the axle, as reverse kingpin skateboard trucks are? On a longboard, reverse kingpin trucks are often used for carving & better turning. It seems this would lend itself well to derby use. The hangers are often reversible, allowing for geometry changes. On the same note, I've never seen steep angle conventional trucks on skateboards. "If you don't go when you want to go, when you do go, you'll find you've gone." Reversed kingpin means the adjuster nut is between the truck and the ground.. Most sk8 boards I am familiar with have reverse king pins..
On a longboard, reverse kingpin trucks are often used for carving & better turning. Are you referring to the flat trucks like the Bear Grizzlies?? It seems this would lend itself well to derby use. The hangers are often reversible, allowing for geometry changes. Big and heavy come to mind.. It takes a lot of metal to pull off any of the exotic longboard trucks.. Besides, the DA45 action (IMNSHO the best action for derby available) has precision pivots and more agility than most sk8rs want.. The plates you posted are quad-style reverse kingpin. The Bear trucks are what I referred to. Longboards use the reverse kingpin trucks more often that the regular skateboards. My Paris trucks are plenty light. The baseplates on these are usually hollowed out. I agree the DA45's are responsive. Wouldn't skate-style reverse kingpin plates do the same thing? Again as in the Grizzly style truck?? NOTE: Mixing skate board and qiuad terminology is confusing..and I don't speak skateboard very well.. So far that has not proven to be a problem.... So how about sketching up exactly what you want.... Always looking for the next big thing.. 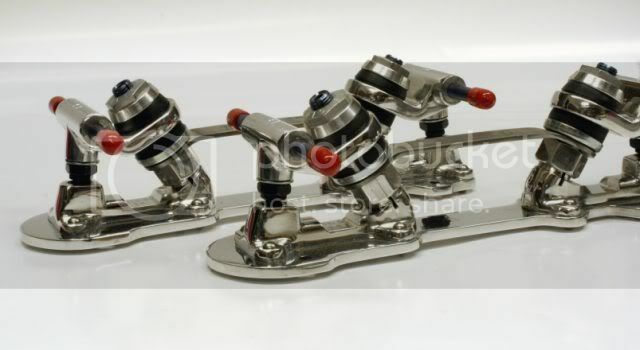 If I had the cash, I'd buy 4 narrow, reverse kingpin skateboard trucks and mock it up! Regular skateboard trucks have less degree to their kingpin. They're designed to be nimble at slow speeds but lose stability at higher speeds. Reverse kingpin longboard trucks have a steeper angle kingpin that tucks under the axle and comes out the same side as the pivot cup. This gives you more stability at high speeds and better turning response. The compromise is turning radius. On flat lower speed terrain, the reg kp skateboard truck, if tuned right, can turn on a dime where the longboard maintains the turning radius of a Boeing 747. As far as wheel base geometry, since the trucks are not connected by a plate, there's no way to compare to a hypothetical roller skate plate but in theory, the design would bring the axles closer together... Again, this would be depending solely on design. This is all based on my experience as a skateboarder, but as you would say, Doc, YMMV. I run a set of Paris V2 trucks on my longboard. They're definitely more stable at high speeds than the Independent trucks that I originally used to run. I now run the Paris as non-drop on a pintail board, compared to running the Independent as drop through on a different type of board. So, for stability, it might be better, but how to adapt them to a quad skate frame successfully would interesting. skater and skateboarder... instantly confused. The "reversible" aspect your talking about is being able to flip the front or rear truck 180 degrees in relation to the board. So on our skates we would also need a 2 piece plate design. Its not the kingpin that is "reversible or reversed" we are all pretty much using "reversed" kingpins. Thing is most decks are predrilled or have some kind of alignment alreday set up. Also the decks are wood, and very rigid, and made to support the weight of a rider. You also dont have to lift your board with your feet, as a matter of fact you can't. Well unless you used some kind of strap or bar like one of those mountian all terrain boards. It pretty much comes down to weight issues I'd say. The amount of carving you would get in addition to what already exists even in a setup like I use(193mm wheelbase on a size 10 boot) , just wouldnt be worth it IMO. You would lose a tremendous amount of wheelbase to gain negligible advantages in agility which would undermine the stability of a skate and only increase its weight as well. Since you'd need a super strong sole to hold up to this daunting task. If you really used a skateboard style truck. 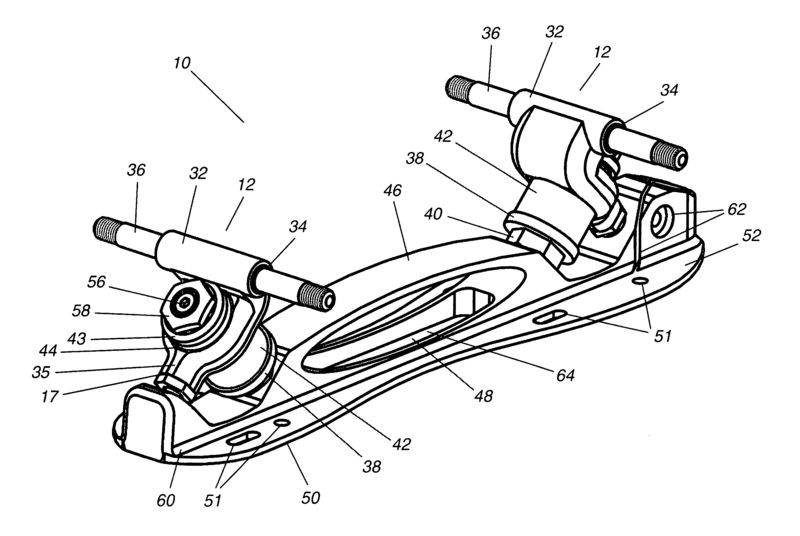 Also, if we want a shorter wheelbase, we typically either build a completely different skate, or as some have done T nut mount and swap plates when they want to on the same boot. Either way the plate and its beam portion is part of our support system. Personally it seems like a novelty. Carving issues is not usually a lack of turning but a lack of grip. .....Jacob makes them here in MA. The thing is, he sells very few. He sells MANY plates, but the ones he sells are his beefed up version of the proline/reactor that has the same milled plate you see in this patent, same adjustable shock absorption pivot, the difference is they have a traditional proline action. I have not skated these since his foot is way smaller so I cant speak to how they skate but the machine work and execution is second to none. They are true 45 degree angle from the plate to king pin, and from pivot to the plate. It's not a matter of turning the plate 180 degrees, its a complete redesign. The kingpin is actually running through the hanger, under the axle and coming out the same side as the pivot cup.